PARAGON SHAVING PARLOR — The establishment is located at 213 East Nash street in Briggs Hotel Block, and it can truthfully be said that it is the most popular Tonsorial parlor in the city of Wilson. It is owned and managed by N.J. Tate and W.S. Hines, both of whom are skilled barbers of long experience. Their genial manner and high class work have won for them the liberal share of the best patronage of the city. Their shop is fully equipped with all the latest appurtenances, and a short visit to this establishment will after passing through their hands, convince you of what the modern, up-to-date barber shops can do to put a man in good humor with himself and the rest of mankind. The shop is equipped with five chairs, each in charge of a professional barber. Go there for your next slave. N.J. Tate — Noah J. Tate. W.S. Hines — Walter S. Hines. JAMES HARDY, SUCCESSOR TO HARDY BROS. — Feed and Livery Stables. This business is located on South Goldsboro street between Nash and Barnes streets and the business has been established for the last four years. The proprietor has succeeded in building up a good patronage. He is very prompt in answering calls and his prices for Livery are very reasonable. Telephone Number 9. Hack and Dray work solicited. The proprietor wants your patronage and guarantees the right sort of treatment. He is a colored man and has the good wishes of all. C.H. DARDEN & SON — This is the only colored firm of undertakers and funeral directors in Wilson, and has been established by the senior member of the firm, C.H. Darden, for some thirty years. His son C.L. Darden has been a member for twelve years years. This place is located at 615 East Nash street, and every branch of the undertaking and Funeral Director business is executed. The equipment includes two Hearses, as well as all other necessary appliances pertaining to the business. They also handle Bicycles and Fire Arms, Victor Talking Machines, Records, Bicycle Sundries, etc. Special attention given to repairs. Their telephone number is 60 and all calls are promptly answered. C.H. Darden — Charles H. Darden. C.L. Darden — Camillus L. Darden. OATES & ARTIS — Family groceries. This firm is located at 601 East Nash Street, with telephone connection 456. The business was established in August 1910 and has steadily increased from the beginning. The stock includes all kinds of Groceries, both staple and fancy, Produce, Teas and Coffee, Tobacco and Cigars and the prices are very reasonable. The members of the firm are Wiley Oates, a native of this county, and who has been residing in the City for two years, and Cain Artis, who is also a native of the county, but who has resided in Wilson for twenty-two years. Both are colored men and they are ably attending to the business. Wiley Oates — in the 1910 census of Wilson, Wilson County: on Vick Street, dredge boat laborer Wiley Oats, 32; wife Nettie, 28; and daughters Dollena, 8, and Dottie Lee, 13 months. Wily Oates died 23 July 1913 in Wilson. Per his death certificate, she was born 26 September 1879 to Adam and Amanda Oates; was a farmer; and was married. IDEAL PHARMACY — This is the only colored Drug store in Wilson, and it has been established for about seven years. The proprietors, D.C. Yancy, Ph.G., receiving his degree from the Leonard School of Pharmacy, Shaw University Class of 1905-06, has been connected with the store for the past three years and gas been sole proprietor for the past year and a half. He reports that the business is constantly growing and he hopes within a very few years to have one of the largest stores in the City. He personally presses over the prescription department and absolute accuracy is his watchword. His motto is “Not how cheap but how pure.” The general stock includes fresh drugs, patent medicines, Tobacco, Sundries, etc, soda fountain in connection. 109 South Goldsboro street, phone 219. 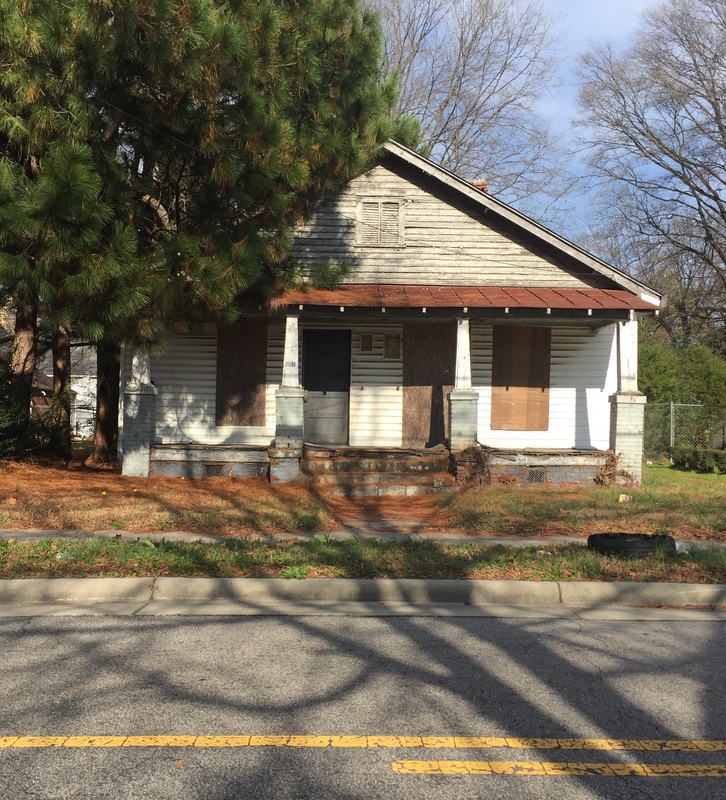 The seventieth in a series of posts highlighting buildings in East Wilson Historic District, a national historic district located in Wilson, North Carolina. As originally approved, the district encompasses 858 contributing buildings and two contributing structures in a historically African-American section of Wilson. (A significant number have since been lost.) The district was developed between about 1890 to 1940 and includes notable examples of Queen Anne, Bungalow/American Craftsman, and Shotgun-style architecture. It was listed on the National Register of Historic Places in 1988. In the 1940 census of Wilson, Wilson County: at 1007 East Nash Street, (1) paying $/11 month rent, Elizabeth Hardy, 29, husband Herman, 33, a “P.W.A.” laborer, and son Leroy, 5; and (2) also paying $11/month rent, Carter Powell, 42, stationary fireman for apartment building, and wife Anna, 35. In 1940, Herman Hardy registered for the World War II draft in Wilson. Per his registration card, he was born 8 December 1907 in Greene County; his contact was wife Elizabeth Hardy, 1007 East Nash; and he worked for Watson Tobacco Company, Wilson. In 1940, Carter James Powell registered for the World War II draft in Wilson. Per his registration card, he was born 4 January 1899 in Nash County; his contact was Sylvester Powell, “no number” East Nash “near Gills Store”; and he worked for Dr. M.A. Pittman, Raleigh Highway, Wilson, who was a second contact. Virginia A. Jones died 3 July 1966 in Wilson. Per her death certificate, she was born 12 May 1879 in Wilson County to Enos and Cherry Applewhite; had been a farmer; was the widow of Joseph Jones; and resided at 1007 East Nash. Informant was [daughter] Elizabeth Hardy, 1007 East Nash. Walter Jones died 31 November 1973 at home at 1007 East Nash, Wilson. Per his death certificate, he was born 10 August 1921 in Wilson County to Joseph Jones and Virginia Applewhite; had been a cook; and was married to Nora Allen. Informant was sister Elizabeth Hardy, 1007 East Nash. Elmer Jones died 21 March 1975 at the Veterans Administration Hospital in Durham, N.C. Per his death certificate, he was born 20 January 1920 in Wilson County to Joseph Jones and Virginia Applewhite; had been a porter-electrician; had never married; and resided at 1007 East Nash. Informant was sister Elizabeth Hardy, 1007 East Nash. Elizabeth Jones Hardy lived in her home at 1007 East Nash until she passed away in 2001. Photograph by Lisa Y. Henderson, December 2017. Saint Aug and Saint Ag ’41. The Pioneer (1941), yearbook of Saint Agnes Hospital Training School. Celesta Belle Hardy McClain was born 1 August 1917 in Red Springs, Robeson County, North Carolina, to Cornelius and Carrie Worthy Hardy. She died 14 October 1990. The Pen (1941), yearbook of Saint Augustine’s College. In the 1920 census of Wilson, Wilson County: on Hines Street, auto mechanic John Marshall, 32; wife Annie, 32; and children Glascoe, 12, Louise, 6, Bessie, 3, and Herman, 1. In the 1930 census of Wilson, Wilson County: at 507 Hines Street, widow Annie Marshall, 42, cook; and children Louise, 16, Bessie M., 13, Herman, 11, Margrette, 9, and Gretchen G., 1. In the 1940 census of Wilson, Wilson County: cook Louise Marshall, 25, and her brother Herman, 20, at 702 East Nash Street. New York Age, 19 June 1920. New York Age, 11 June 1927. New York Age, 6 September 1941. Samuel Jones was the son of Samuel Vick’s sister Nettie Vick Jones. Snaps, no. 2: Nina F. Hardy. Nina Hardy, circa early 1960s. Nina Frances Faison Kornegay Hardy was born March 15, 1882, probably in northern Duplin County to John Henry Aldridge and Addie Faison, who did not marry until 1885. She seems to have been married briefly to Joe Kornegay in 1899 in Wayne County, but is not in the 1900 census. By 1910, she had made her way 40 or so miles north to Wilson and was listed as “Nina Facin,” boarding on Elba Street in the household of Jesse and Sarah Henderson Jacobs. The census also shows a “Nina Facon” living and working as a servant in the household of Jefferson D. Farrior in Wilson. Though described as white, this is almost surely Nina Faison, who cooked and cleaned for the Farriors most of her working life. Aint Nina lived up over the Farrior house on Herring Avenue. Herring’s Crossroads, whatever you call it. And that’s where she come up there to live. Well, the maid, as far as the help, or whoever, they stayed on the lot, where they’d have somewhere to sleep. So Aint Nina was living on Nash Road, way down there, and when we went to see her, me and Mamie would run down there five miles. She was working for Old Man Farrior then. When she was living out in the country, she was working for white people, and so she went up to their house and cooked for them. And when we’d go down to her house, she’d have to come from up there and cook when she get home. So we would go and spend a day, but it would be more than likely be on her day off. But when we had the horse and buggy, Mama drove out there once, and we went, I went with Papa with the wagon to where you grind corn to make meal, down to Silver Lake or whatever that place was down there. Lord, them were the good old days. The Farriors, their back porch was closed in. It had windows. And had a marble floor in the back, and that stairway was on, where it was closed in on the back porch, you could go upstairs, and there was a room up there. You couldn’t go from out of that room into the other part of the house. You had to come back down them steps then go in the house. And that’s where Aint Nina stayed. I said, Lord, I wouldn’t want to have stayed up there. And then something happen … She had to come down and go down the steps, go upstairs, I mean, and come out of the kitchen, and then go up them steps out on this porch in her room. So she stayed up there. Lord, I wouldn’t want to stay up there. She get sick out there, she couldn’t get nobody. I didn’t see no – I was up in there one time, and I went up there just to look around. Well, she had a nice room, nice bed and chair and dresser and everything. There was a whole set in the room where she was. That was the only time I was up there. But I wouldn’t want to stay up there. In 1917, Nina married Julius Hardy in Wilson township. They had guinea chickens. A car run over a chicken and killed it, and it kept going. And we, me and Mamie, was going out there, and we picked up the chicken and carried it ‘round there. And Aint Nina poured water and scald the chicken and picked it and cooked it, and we had the best time eating it. Wont thinking ‘bout we was going out there to eat. And so we come walking in there with that chicken, and she wanted to know, “Well, where’d you get that?” “A car run over it, and we picked it up and brought it on over so you could cook it.” And she said, “Yeah, it’s good. A car just killed it?” And it wasn’t too far from the house. And I reckon it was one of her chickens anyhow. Honey, she cooked that old stewed chicken, had to put pastry and vegetables in it. Lord, we stayed out all that time, then had to come home from way out there. But we was full. And her brother, his name was James Faison, lived across the street from her, and his wife, and I think the lady had been married before because they wasn’t his children. It was two girls. And he worked at the express, at the station. The place was on that side, Nash Street station was over on this side. Baggage used to come over there. The baggage place where’d you take off the train. That’s where you put it over on that side at that time. And he was working over there. In the 1940 census of Wilson, Wilson County, Nina Hardy is listed as a maid in the household of lawyer William D.P. Sharpe Jr., next door to Annie V. Farrior and her brother Marvin Applewhite. Did the families share her services? In 2004, a Farrior descendant sent me copies of several photos of Nina Hardy. They were likely taken in the early 1950s, a few years before Annie V. Farrior’s death. The Farriors’ grand home, with its immense columned portico, was demolished in the 1960s. Undated photograph of the J.D. Farrior house found at Images of North Carolina, http://www.ncdigital.org. Color photo in possession of Lisa Y. Henderson. Many thanks to J.M. Brock for sharing his family photos.